London Computator Corporation model L.C/509/S. 275 x 188 x 118 mm (10.8" x 7.4" x 4.6"). 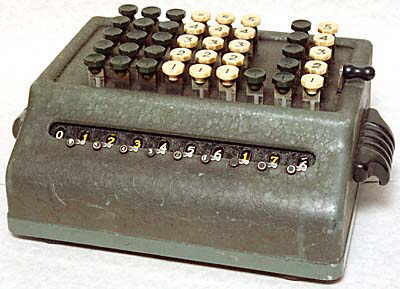 It is a model L.C/509/S where the 5 denotes the abbreviated keyboard (keys up to 5), the 09 denotes the 9 columns of keys, and the S denotes a Sterling currency version. 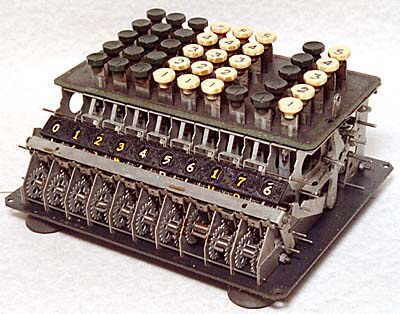 Has 6 decades of £ keys, with shillings and pence keys in columns on the right, all abbreviated to 1 to 5. To enter a number between 6 and 9 two keys have to be pressed in succession in that column to give the required number. The lever on the right is for clearing the total. The machine in the photograph above shows the total £123,456 17s 6d. It is labelled "Manufactured by London Computator Corporation Ltd., 39 St. James's St., London SW1. Sole distributors ADDO CO. (Britain) Ltd."
The machine illustrated has serial number L.C/509/S/1445. The London Computator Corporation, Limited, was formed by Bell Punch to deal with the sales side of the Plus and Sumlock machines. However, it is odd that this machine is not labelled "Plus", and that it is distributed by a completely separate company, Addo. In this model the casing has changed from the previously used Bakelite to die-cast metal, which was to be used on all subsequent models. The mechanism of these machines operates on the return stroke of the keys and there is interlocking between the keys to prevent more than one key in a column being inadvertently pressed at the same time. The machine with its cover removed.